In the effort to advance a more biblically sound theology within the Church, this paper shows how the theological principles and exegetical practice of Joseph Ratzinger/Benedict XVI provide an outstanding example of how to implement the above mandate of Dei Verbum as highlighted in the International Theological Commission’s recent work. The paper applies Ratzinger’s thought to concrete biblical texts involving the New Testament’s ostensibly failed expectation that Christ’s parousia would occur within the apostolic period. The question that arises from a reading of these texts is quite simple: Why has Christ not come back yet like he seemed to say he would? By searching out the intention of Scripture’s sacred authors in relation to the expectation of an imminent parousia, Ratzinger offers a compelling apology for the existence of thorny biblical texts and dogmatic formulas within the Catholic tradition. If you wish to read the entire article, you can download it here. If God exists, he is not the God of the Christian Bible. At least this is the conclusion drawn by many prominent authors and cultural commentators in our society today. The rise of agnosticism and atheism in contemporary culture cannot be traced merely to a single cause, but, certainly, one significant factor lies in a recent increase of interest in the Bible. Mind you, what I am talking about here is, not popular devotion, but, rather, the fashionable trend of calling attention to the deep discord that seems to exist between the God Christians preach and the God casual readers find, when they actually explore the Bible. Pick up Richard Dawkins’s The God Delusion, Christopher Hitchens’s God Is Not Great, Bart Ehrman’s God’s Problem, or any number of similar titles, and there you will find the same basic conviction: you cannot read the Bible seriously and still be a Christian. The recent barrage of attacks on the Bible in the media has elicited a series of responses from the Catholic Church, most recently, in the form of documents from the International Theological Commission (ITC) and Pontifical Biblical Commission (PBC). Although I have authored a book-length treatment of this subject, I have not yet had the occasion to comment on these particular texts which were published just last year. Seeing that neither I, nor hardly anyone else, has commented on these texts, I thought it appropriate to offer a survey of their principles. You can find my recently published article “How to Read the Bible and Still Be a Christian: The Problem of Divine Violence as Considered in Recent Curial Documents” this month in Homiletic and Pastoral Review. “Violence is incompatible with the nature of God.” In his 2006 Regensburg Address, Pope Benedict XVI penned this line as part of his ongoing effort to disentangle theology from ideologies which “might even lead to the image of a capricious God, who is not even bound to truth and goodness.” Although Benedict had Islam in his sights in making this particular point, the same warning equally applies to Christian theology and Scripture. In its recent document God the Trinity and the Unity of Humanity, the International Theological Commission offers important principles to reconcile the many Old Testament texts in which God ostensibly acts against his own nature by commanding deeds such as the slaughter of men, women, and children. 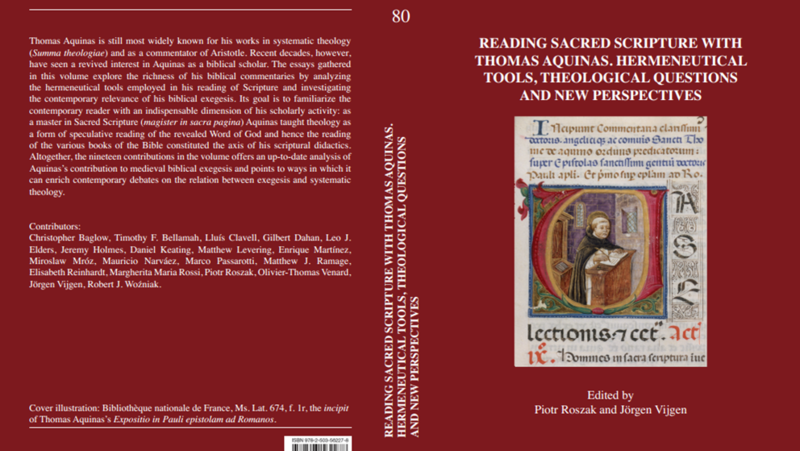 I am publishing a piece on this subject in the upcoming volume of Scripta Theologica, which is published by the University of Navarra in Spain. Since most of you probably don’t have access to this journal, I’ve attached the pre-publication version of the article here. Basically, it summarizes key hermeneutical principles from my book Dark Passages of the Bible, adds several helpful cues from the International Theological Commission’s recent work, and applies them to Psalm 137, one of the most beautiful and yet disturbing texts of the Old Testament. My previous post at Strange Notions underscored the often-unacknowledged philosophical premises at work when believers and non-believers sit down to debate about things biblical. In the course of my argument, I pointed to a possible area of common ground for Catholics and agnostics/atheists. A survey of statements by thinkers as different as Benedict XVI and Bart Ehrman reveals an important agreement upon the reality that everyone carries their own philosophical presuppositions and that a purely objective consideration of Jesus’ miracles is therefore impossible. Today I carry forward this discussion. By way of doing this, I first briefly summarize Bart Ehrman’s position on Jesus’ divinity and resurrection. Then I critique what I consider to be an insufficient (but very common) Christian response to the skeptic’s position. Finally, I dwell upon a couple keys given by C.S. Lewis and Pope Benedict XVI which point out from a Christian perspective the direction a philosophical dialogue about miracles needs to head. Find the article here at Strange Notions. Today at Strange Notions I published a reflection revolving around this poignant line from Joseph Ratzinger’s 1988 Erasmus Lecture in which he famously called for a “criticism of criticism.” In penning these words, the German cardinal was looking for a self-criticism of the modern, historical-critical method of biblical interpretation. On the part of those involved in the craft of exegesis today, this would entail the effort to identify the philosophical presuppositions we bring to our reading of the biblical text and to consider honestly the degree of certainty warranted for the conclusions we draw when it comes to things biblical. Check out the article here. Now that our semester here at Benedictine College is coming to a close, I am able to take some moments to update on recent happenings in my scholarly life. I have a handful of articles coming out here and there which I will eventually post, but here are a few book reviews (of my book and a published review of another book). Will Many Be Saved? What Vatican II Actually Teaches and Its Implications for the New Evangelization by Ralph Martin, for Nova et Vetera 12.4 (2014). The above text is a must-read for Christian, especially Catholic, evangelists as it challenges the widespread conception that pretty much everyone is going to be saved. 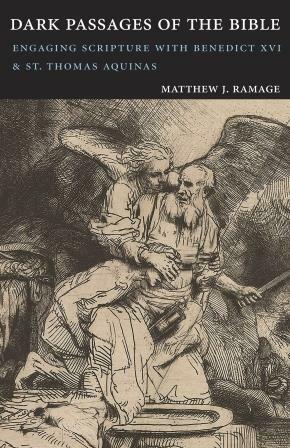 In this work Martin takes two very important Catholic intellectuals to task–Rahner and Balthasar–and argues persuasively that a proper reception of Vatican II must involve renewing our understanding of the possibility of damnation for those who culpably reject the gospel. While continuing to have immense respect for the great theologians Martin critiques, I have had to revisit my assessment of their soteriology in light of Martin’s thorough analysis. In sum, Martin’s work is a timely reminder that the true spirit of Vatican II is to be found within its texts in their entirety. To be sure, Lumen Gentium represents a development with regard to how the Church views the status of non-Christians. However, Vatican II also soberly reaffirms the real possibility of damnation and thus the need for Christian missionary activity. The Church today needs a properly balanced pastoral strategy cognizant of both the universal action of the Holy Spirit and the pervasiveness of sin which poses a real threat to salvation. UPDATE 12/31/14: Thanks to Dr. Michael Barber over at The Sacred Page for listing Dark Passages of the Bible among his Top 5 Academic Reads of 2014! Summer is over and things are back in full academic swing here at Benedictine College. As a result, I now resume the work of sharing works here and there as I have them published in various venues. The Fellowship of Catholic Scholars puts out a wonderful monthly publication called Teaching the Faith. This is a great resource for homilists and faithful alike who wish to enter more deeply into the liturgical readings. The following is my essay which will be appearing in the publication for the upcoming feast of the Exaltation of the Holy Cross on September 14: This is the website where you can download this and other other new meditations every month. The Gods of Israel: Does the Bible Promote Polytheism? “What great nation is there that has a god so near to it as the LORD our God is to us, whenever we call upon him?” This passage from the Book of Deuteronomy was recently proclaimed in the Catholic Church’s Lenten liturgy, and it touched right at the heart of something I have been pondering for some time: evidence of polytheism in the Bible and the relationship between ancient Israelite and Canaanite religious traditions. Popular critics of the Judeo-Christian God frequently focus on the apparent incompatibility of the biblical portrait of God with what we insist must be essential moral attributes of the divine nature should it even exist. Both critics and believers, however, are often unaware of another crucial problem that would seem to contradict traditional Christian doctrine concerning the nature of God. In a nutshell, the tension lies not only in the relation of the biblical God to violence and evil, but also on the arguably more fundamental level of whether the Bible reflects belief in only one divine being in the first place. I have devoted a chapter to this very theme in my book Dark Passages of the Bible, and even there I barely scratch the surface of this issue. Nevertheless, I have continued to ponder this issue over the past couple years and believe something meaningful can be said within the constraints of a blog post. You can find my response here which went up today over at Strange Notions. Psalm 137: Is God Pro-Life or Pro-Death? O daughter of Babylon, you devastator! Then try to explain that to atheists. The following is a link to my attempt at doing just this. It is published on Strange Notions, a popular website devoted to promoting dialogue between Catholics and atheists. The site bills itself as a “digital Areopagus,” echoing the famous dialogue of St. Paul with the Athenian philosophers in Acts 17. I recommend bookmarking it and perusing the resources blogger Brandon Vogt has made available which are geared toward helping us Catholics better defend the faith in the modern, digital world. This is not an easy question to answer when you look at all the evidence honestly, but there are answers out there! This is a topic I take up in my recent book Dark Passages of the Bible, which was recently discussed along with other important works on the subject by Brandon Vogt. See his post here. The existence of the devil is not very compatible with modern thinking. Such is the view confronted by Benedict XVI in a response he once wrote to a book called Farewell to the Devil. Its author, an Old Testament scholar, expressed the view of many a modern man in claiming, “By now we have understood that the term ‘devil’ in the New Testament simply stands for the term ‘sin.’” The devil is just an image for sin, just something Jesus talks about to keep a little holy fear in us—but not someone we really have to fear, someone whose existence we can prove and wiles we can’t explain otherwise through modern psychology. 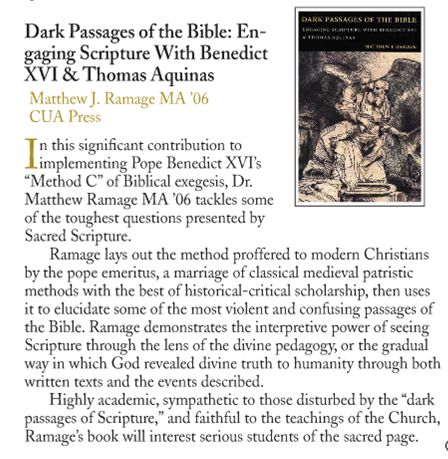 I recently authored a book entitled Dark Passages of the Bible: Engaging Scripture with Benedict XVI and Thomas Aquinas. In that book one of the three main themes I treat is the problem of evil in the Old Testament. I encourage you to read my post at Benedictine College’s Gregorian Institute on what Pope Benedict has to say about the existence of the devil. Do the Scriptures really affirm the existence of the devil, or is he a superstition from a bygone age which enlightened people today need to move beyond? I was happy to find out this week that my forthcoming book is in the Fall catalog of Catholic University of America Press and set to be in print by September. It is already available for pre-order on Amazon. A more extended blurb can be found on the CUA Press website. The cover we decided on (above) is a Rembrandt sketch of the scene from Gen 22 when Abraham is called by God to slaughter Isaac–a dark passage indeed! Of course, Abraham did not have to go through with the physical action, but it still stands out as a particularly evocative “dark passage” and one that is well represented in the Church’s artistic tradition. I am convinced that good exegesis involves two sages. Firstly one has to ask what the respective authors intended to convey through their text in their own day–the historical component of exegesis. But it is not sufficient to leave the text in the past and thus relegate it to history. The second question posed by good exegesis must be: is what I read here true? Does it concern me? If so, how? With a text like the Bible, whose ultimate and fundamental author, according to our faith, is God himself, the question regarding the here and now of things past is undeniably included in the task of exegesis. The seriousness of the historical quest is in no way diminished by this: on the contrary, it is enhanced. The governing idea of Benedict’s exegetical plan is really quite simple, but by no means simplistic. First, to understand the Bible, you first have to appreciate what it meant within its original context. Scripture was written by the Holy Spirit, but it was also written by human authors who had particular aims within their unique historical context. According to the Holy Father, we do violence to Scripture if we forget its place within the history of salvation, what God wanted to achieve for his Chosen People through it, and what challenges the sacred word presents for us now looking back on that history. Second, for Benedict good exegesis requires that we let the Bible speak not only for itself within its original context, but that it speak also to us today. Here the things of the past which we encounter in the first step of exegesis take on significance in the here and now. We bring the Bible to prayer and patiently meditate on it. We ask how its message applies to our lives today, how it can transform us in the concrete circumstances of our daily existence. Examples abound where Benedict goes on to put these ideas into practice in his various works. If you have any other examples of him speaking in similar terms, please post them. In this post we’ll continue and conclude our discussion of the parousia with a few more words on the second volume of Pope Benedict’s Jesus of Nazareth. As we saw last time, the Holy Father described Jesus’ apocalyptic discourse as “perhaps the most difficult text in the whole of the Gospels.” On this subject we explored Benedict’s distinction between the “images” Jesus employed and the “realities” that comprise the “essential content” or “nucleus” of his teaching on the end times. Benedict argued that the intention of the Evangelists did not lie in describing the physical but rather the theological demise of the Temple. As to whether the sacred authors of Scripture thought the Second Coming would occur in their day, in some places he indicates that this was the case. Ultimately, however, he left the question open and deemed it a non-essential issue. Today I would like to turn our attention to Benedict’s ensuing discussion which adds nuance to the foregoing argument. Immediately after elucidating what he considers to be the “nucleus” of Jesus’ eschatological discourse, he adds that “the nucleus of Jesus’ eschatological message includes the proclamation of an age of the nations.” This age is the time of the Church, which the Bible portrays as the intervening period following the time of Jesus’ earthly pilgrimage and preceding his return in glory. To be sure, the Holy Father reminds us that certain passages explicitly state that “this generation will not pass away” before the end (Matt 24:34). Other texts, however, affirm what he said above–namely that the parousia will not occur “until the times of the Gentiles are fulfilled” (Luke 21:24) and that “the Gospel must first be preached to all nations” (Mark 13:10; cf. Matt 24:14). To this he further adds, “Paul, too, recognizes an age of the Gentiles, which is the present and which must be fulfilled if God’s plan is to attain its goal.” In this way, one can see that drawing a one-to-one correspondence between Jesus’ use of eschatological imagery and his thought concerning the chronological end of the world would constitute a “superficial reading” of the Gospels. The fact that the early Church was unable to assess the chronological duration of these kairoi (“times”) of the Gentiles and that it was generally assumed they would be fairly short is ultimately a secondary consideration. The essential point is that these times were both asserted and foretold and that, above all else and prior to any calculation of their duration, they had to be understood and were understood by the disciples in terms of a mission. The bottom line is that the Bible does not formally assert the precise time of the Second Coming. Although we find indications of what individual apostles thought concerning the matter, Benedict understands that for them this was “ultimately a secondary consideration.” Whether they thought the world was going to end within a day or a year or a decade, he tells us that the “essential point” they were asserting concerned the need for spiritual preparation, for mission, and for endurance in the face of persecution. It turns out that these are realities that must govern Christians’ lives regardless of the epoch in which they live and how much time remains in their earthly pilgrimage. They are the core message, the true key, to understanding the Bible’s parousia passages. I am sure we could add to this, but this is as much as Benedict says here. And thus our ongoing discussion of the parousia draws to a close. What we have seen in the preceding posts is Benedict XVI offering a serious, thoughtful answer to the observation that the early Church apparently got it wrong in expecting the Second Coming to occur in the first century. Benedict follows many of his modern counterparts in acknowledging evidence to this effect, but he also is careful to note that it was not a universally-held belief among the authors of Scripture. Careful to safeguard the integrity of Scripture, he furthermore shows that the core messages affirmed therein remain intact regardless of whether or not the apostles had an accurate idea of when the parousia would take place. Not every word in Scripture is asserted or taught for its own sake, and it in no way violates the doctrine of biblical inerrancy if biblical authors at times hold less than exact ideas about issues that are of secondary importance and not being asserted as such. The above understanding of biblical inerrancy may catch some Christians off guard, but that is because many are accustomed to reading Scripture as if every last sentence was dictated by God and making an infallible claim. To be sure, it is easy to swing too far in one direction and fail to bear in mind the inspiration, inerrancy, and divine authorship of the Bible. However, Pope Benedict’s treatment of the parousia reveals that we can only do justice to thorny Scripture texts if we also give due respect to the real claims made by their human authors. The brilliance of this balanced approach may not immediately click with everyone who is new to reading Benedict and these posts, but one of the main goals I aim to achieve in my writing is to continue presenting Benedict’s exegetical method anew in accordance with the myriad ways he has instantiated it over the years. You’ll thus be hearing a lot from me on other topics that deal with similar questions using similar methods. Next time you hear from me, however, it will probably be a very different kind of post as I’ll be reporting from Greece and Turkey on a pilgrimage-class I am leading for Benedictine College.